I wrote a new piece outlining some of the dangers of using timed tests in math, such as how they promote math anxiety and cause children to be afraid of making mistakes in math classes. Should you use timed tests for math facts? Here's an interesting story problem that I received in an email! As it's impossible to divide 17 into half or 17 by 3 or 17 by 9, the three sons started to fight with each other. So, they decided to go to a farmer friend who they considered quite smart, to see if he could work it out for them. The farmer friend read the will patiently, after giving due thought, he brought one of his own horses over and added it to the 17. That increased the total to 18 horses. Now, he divided the horses according to their fathers will. You might already know that the placement tests on my site work equally well as generic math assessment tests. I also evaluate the test results for free. Now you can see an example of one student's test results and my evaluation here. Many students need to take two or even more tests in order to get a full picture of the gaps they have in their skills and knowledge. That was the case with this student also: she actually took three tests, grade 6, 5, and 4. 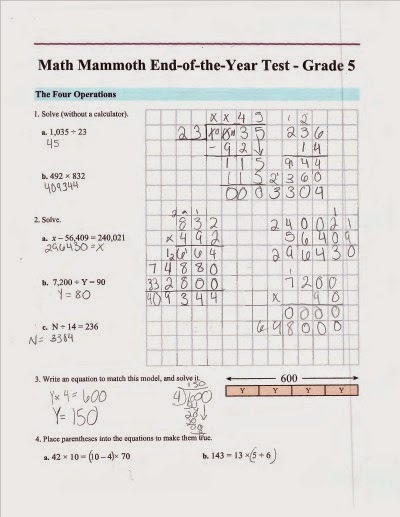 I posted two of the tests and my evaluation at MathMammoth.com site. I hope it's helpful! Number talks are short discussions among a teacher and students about how to solve a particular mental math problem. The focus is not on the correct answer, but on all the possible methods of finding the answer. To start a number talk, the teacher gives the students a SHORT math problem to solve — but the students are not allowed to use a calculator or paper & pencil. The idea is to solve it in one's head! For example, you could ask students to solve 5 × 18 using mental math. Read morehere - and see a great video by Jo Boaler. This is a "tool" you can't afford to miss as a math teacher!